makes it easy for organizations around the world to receive questions and input from audiences of any size. Two recent uses of Moderator show how this tool can be useful worldwide. 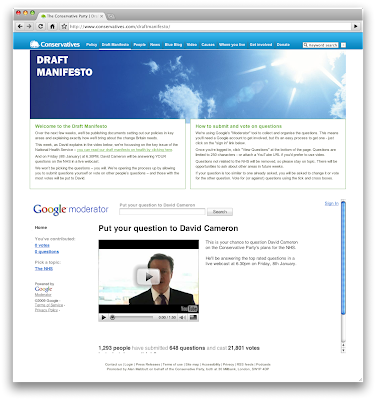 Across the pond in the UK, the Conservative Party is using Moderator to power their new Draft Manifesto site. They're asking citizens to post questions about their health care plans and vote on submissions from others. Party Leader David Cameron will then answer the top questions in a live webcast this Friday. With three days to go, over 1,300 people have cast more than 20,000 votes. Moderator was also a key component of the CNN/YouTube Debate at the recent Copenhagen Climate Change Conference. 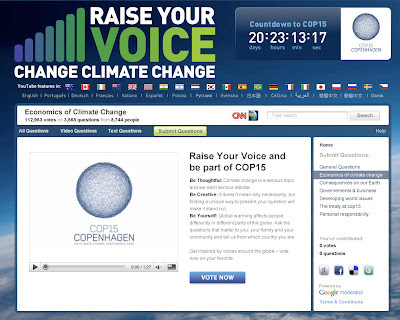 Visitors worldwide submitted text and video questions for the debate through Moderator, and the top questions were answered by a panel of climate experts, including Kofi Annan, Thomas Friedman, Yves de Boer, Bjorn Lomberg and Daryl Hannah. We believe technology can empower citizens to become involved in policy-making at all levels of government. We're excited to see this process take place around the world and across all political ideologies. Have other examples of Google Moderator or other online tools improving the policy-making process? Let us know in the comments. Google Moderator makes it easy for organizations around the world to receive questions and input from audiences of any size. Two recent uses of Moderator show how this tool can be useful worldwide. Oh! Great, these kinds of sites are really helpful for searching good and useful stuff Thanks for this informative site. Thank you for your information. useful information.